What is Sweet Tooth Smoothie™? If your goal is to lose fat, gain muscle, increase strength, power, peak performance, growth hormone levels, prevent muscle loss while dieting, improve your overall physical fitness, increase the amount of protein in your diet, or just have a delicious drink, then Whey Protein can help. Sweet Tooth Smoothie™ contains a blend of the purest and highest quality Whey Proteins available, Whey Protein Concentrate (WPC) and Whey Protein Hydrolysate (WPH). The WPC used in Sweet Tooth Smoothie™ is manufactured using a gentle cold cross-flow, ultra-filtration, and advanced nano-filtration process. This advanced cutting edge purification and filtration process produces an almost completely undenatured, in-tact protein. This means that it maintains more of the amazing natural properties and benefits of Whey Protein, unlike other sources such as Whey Protein Isolate, which may lose their biological activity during processing. Our WPC also contains healthy fats, such as CLA, and higher levels of immunoglobulins and lactoferrins to support immune function. It’s naturally high in Branched Chain Amino Acids (BCAA’s) and Glutamine (Over 7 grams of BCAA’s and Glutamine per scoop). We’ve also added additional Glutamine to help with recovery. In addition to all of the possible health and immune system benefits, Whey Protein has proven to be essential for athletes and those wishing to increase lean muscle mass and lose fat. 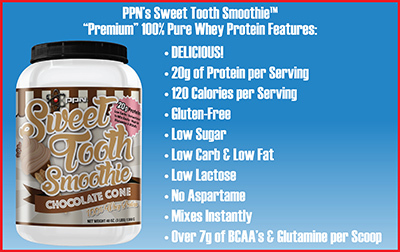 Why Use PPN’s Sweet Tooth Smoothie™? Many companies claim to have the highest quality and purest products, but how do you know if you are truly getting what they claim? Unless it says Pure Performance Nutrition on the label you simply do not know what you're getting. While many Whey Protein products look alike, their ingredients often differ in quality, and definitely in taste! At PPN we use only the highest quality ingredients available. 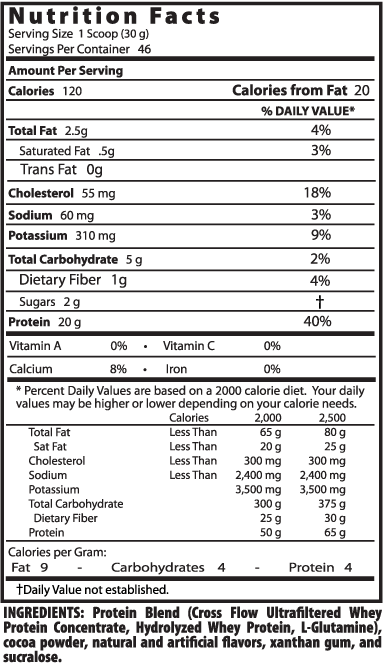 PPN's Sweet Tooth Smoothie™ is manufactured in a cGMP, NSF Safe for Sport Certified facility. It is lab tested to guarantee quality, purity, potency, and no amino spiking! PPN is a brand you can trust...You Can Bet Your Body On It! PPN’s Sweet Tooth Smoothie™ is the ideal complement to our Rapid Thermal® 24-Hour Fat Loss System. Or try it with our Muscle Building GunPOWDER® or Ballistic® for increased performance. As a dietary supplement mix one scoop with 6-8 ounces of water, skim milk, juice or your favorite beverage. PPN’s Sweet Tooth Smoothie™ Premium Whey Protein can be used as a fast and simple alternative to breakfast, lunch or dinner. It can also be used as a snack in between meals. It is great for a pre-workout protein source and perfect for a post-workout recovery drink, or simply anytime you want to add additional protein to your diet.